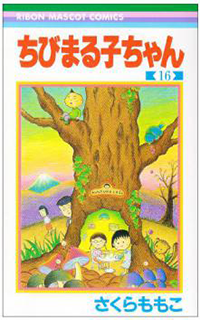 The title character, Maruko, is a nine-year-old third-grade student. She is lazy, disorganized and usually late for school, in strong contrast with her neat and tidy older sister who must share her room with her. Maruko, like many kids, tries to avoid homework and chores, takes advantage of her doting grandfather and squabbles with her sister. Nevertheless, she is a well-meaning child who tries to do good. Maruko's real name is Momoko Sakura (さくらももこ Sakura Momoko), the same as the pen-name of her creator Miki Miura 三浦 美紀 (who used her own childhood experiences as inspiration). Her nickname "Maruko" is made of marui ("round", because of her round face) and -ko (girl child); the prefix chibi and the suffix -chan also refer to a cute child. Maruko's trademark face fault in reaction to embarrassment is the sudden appearance of vertical lines on her face, sometimes with an unexplained gust of wind blowing behind her head. This is sometimes mimicked by female fans of the series who draw the fingers of one hand down across the face to show embarrassment. On the internet this is often used as emoticons, by speech marks. For example: -_-"
Other characters include Maruko's classmate and best friend Tama-chan. A fan favorite is Maruko's kind but absent-minded grandfather. Naive and easily tricked, he keeps a pet turtle and loves watching TV with Maruko. When feeling distressed or nostalgic, he spontaneously retreats to a surreal inner world for a few seconds to improvise a sad yet comical haiku about his state of mind. May I TS 9.4? No problem or nobody works on it right?